Restaurant week starts today. It has become a yearly feature now. Families look forward to enjoying a night out at a reasonable price and restaurants offer dishes around a particular item. This year, the star of the plate is plantain. There was a time when the choices for those who wanted to eat out were very limited. Our photograph this week is of a place that was very popular in the late 1970s and 1980s. Wings was at the airport. It was mostly a bar offering a variety of drinks and some fast food. As can be seen in the image, cigarettes were another popular item. 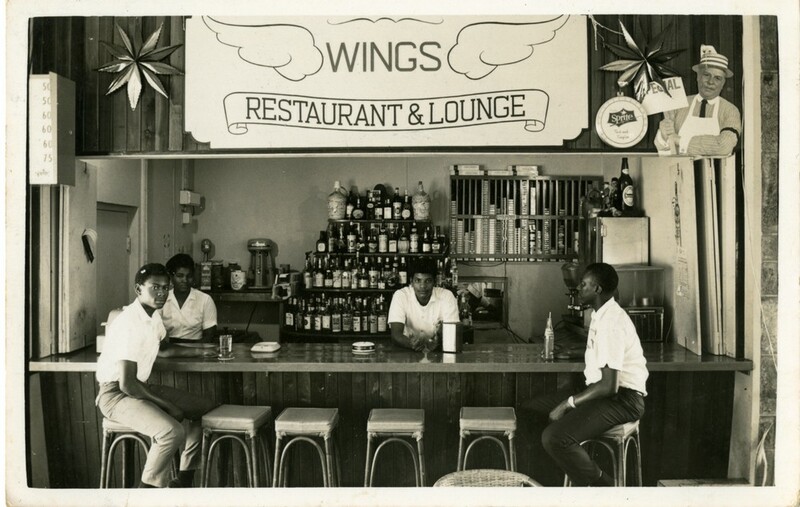 At the time, entertainment was very limited, and Wings became a popular liming spot for adults, in the evening. It was also popular with families during the day, especially on weekends. While there, adults would meet friends who would be picking up or seeing off relatives and catch up on the latest, while the children would enjoy watching the planes take off and land. Please get in touch with us If you have information on who ran Wings or stories related to it. We would also love to hear about other restaurants.